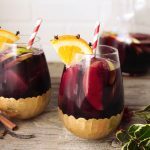 This time of year I feel like as much as I am craving holiday flavors and traditional recipes, I am also looking to keep things as simple as possible and I really look to and work hard to stay on track with my eating. No reason to throw everything I work so hard for all year long, right out the door for a month of terrible choices. Between holiday parties and gatherings, events, my yoga teacher training coming to an end, mass amount of holiday orders from our websites, gift shopping and everything else, time is of the essence right now. There hasn’t been much extra time to bake cookies or to make homemade everything, like I always try to. When I was approached by Silk about their new Cashewmilk, I was super excited at the opportunity to try it and report back to you guys. We all know that I am the queen of homemade nut milks, but I am always on the lookout for store-bought alternatives, both for myself when life gets busy, but also for those of you that don’t have the desire or time to make homemade nut milks. For me, the important things I look for look for are brands whose nut milk products are certified non-GMO, certified gluten-free, are minimally processed, free of artificial flavors and preservatives and don’t contain carrageenan. I also prefer unsweetened nut milks, so I can control the amount and type of sugar used. 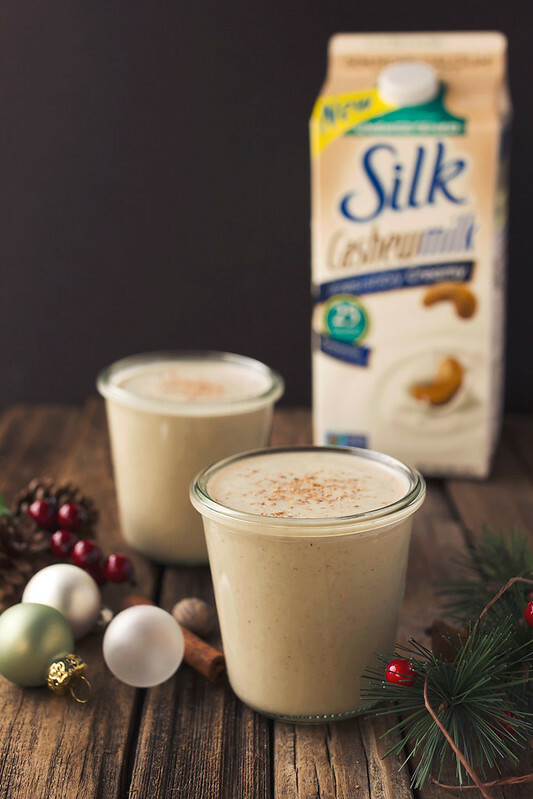 Silk’s new Cashewmilk is a really great alternative to both homemade nut milks and if you are looking to make the switch, it is a great substitution for regular dairy milk, with 50% more calcium than dairy milk with only 25 calories per serving (25% less than skim milk)*. It’s so irresistibly creamy and delicious, it’s great over cereal, in your favorite recipes or just on it’s own. 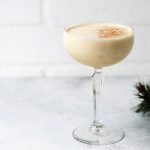 The moment I poured the first glass and saw just how thick and luscious it was, I immediately was inspired to recreate my favorite classic holiday drink, eggnog. I know eggnog is one of those, you either love it or you hate it kinda things, but I just love it. There is nothing like sipping on a thick, creamy, luscious glass of that spiced goodness, with a shot of some spicy warming liquor, by the glow of the Christmas lights, with my favorite holiday tunes playing in the background. Since I tend to avoid most dairy these days, I usually treat myself to one carton of non-dairy nog each year and I try make it last for the season. But, to be quite honest, I don’t always love how much sugar is in there and it still isn’t quite perfect for me. As I always say, homemade is always better. 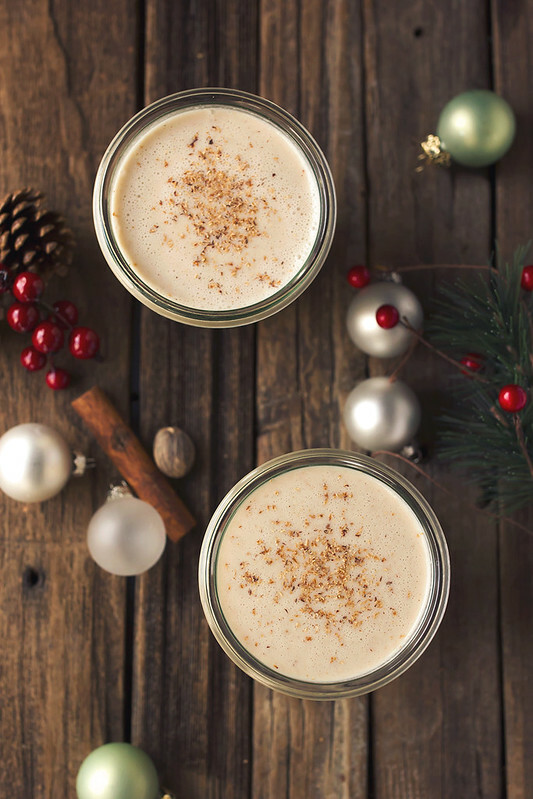 This thick and creamy, vegan eggnog is great made with homemade cashew milk and it’s just as amazing made with Silk’s new unsweetened Cashewmilk. Great as it is, even better with a shot of your favorite spirit. 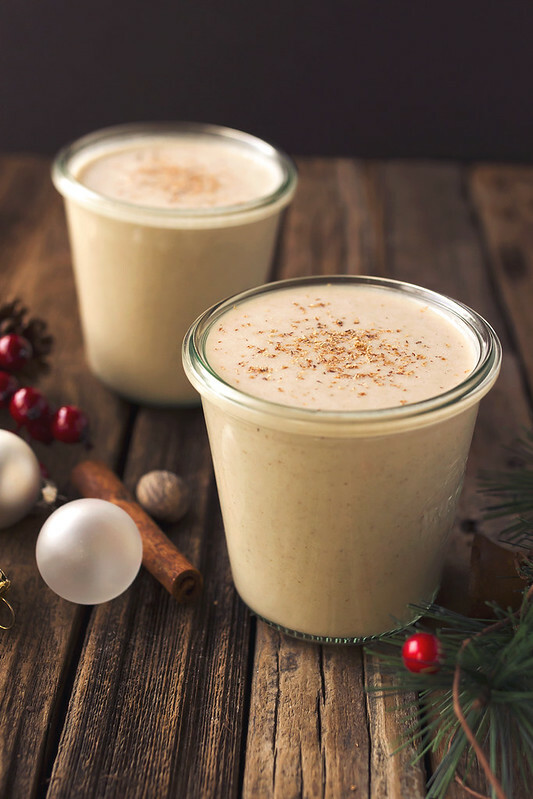 Don’t skip on the freshly grated nutmeg, it’s what makes this homemade eggnog special! Oh, my word. Here I thought this would be soooo complicated. I’m so stinking excited to try this. I really miss eggnog!!!!!!! Thanks for sharing this recipe. I haven’t seen this cashew milk yet. I’ll have to keep an eye out, I definitely want to try it. This looks amazing! I can’t wait to try it! I just bought cashew milk the other day, so this recipe is perfect! Thanks for the recipe! I hope we get it in West by god Virginia pretty soon! Would you say that this is creamier than their almond milk (which isn’t very creamy in my opinion)? The cashew milk? Yes it is absolutely creamier and thicker than almond milk. 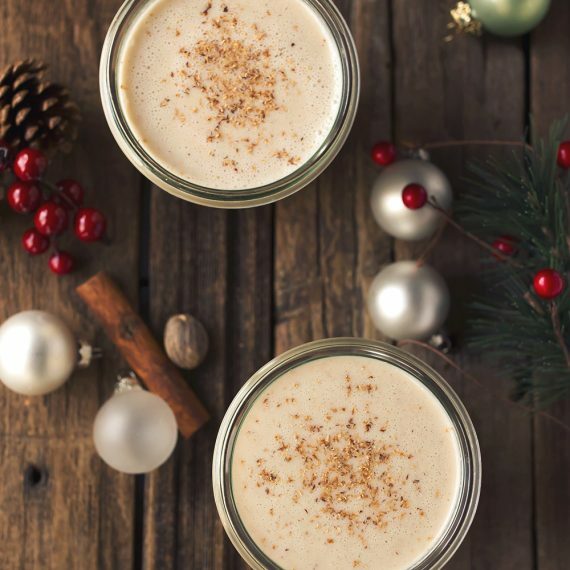 So okay, here’s the deal: I have been looking for a good vegan eggnog recipe since my husband bought me a bottle of Sailor Jerry’s Spiced Rum. I made this recipe today. I used the original Silk cashew milk, omitted the extra cashews, Trader Joe’s extra thick and creamy Coconut Cream, 6 dates, some fresh grated nutmeg, cinnamon and teeny tiny bit of cloves (they can be strong). HOLY MACARONI, OMG, GOOD GRIEF LORRAINE……this is an XLNT recipe!!!! I want to thank you soooooooo much for coming up with this one!!!! Thank you, thank you, thank you. Totally awesome!!! okay, because of this one recipe review, I’m going to make this… Great review! Keep em coming. I am a fan of the Silk cashew milk, and the dark chocolate also. It’s creamy and has a mild taste. Please make eggnog with cashew milk. Eggnog is not supposed to taste like coconuts. Coconut has a piercing flavor that cannot be disguised so although I like the flavor of coconut milk, I hate the taste of coconut mixed with anything else. Plus it is thin as water. Not good eggnog! I will try my own recipe with just Silk cashew milk. I know it is selling but that’s because there is no alternative, at least in our stores. That’s all anyone will carry. This recipe sounds amazing and I would love to try it. The coconut milk is the kind in the can, correct? Can the lighter, less fat version of the canned stuff be used instead? Thanks! Yes canned. But of course, light could be used, it will just be a little less thick. This looks like a good recipe, but I do wish there wasn’t so much advertising here for Silk. It used to be a great company – all organic and a nice small company that made a good product, but now it’s owned by a major dairy conglomerate, and is a major user of non-organic soy and other ingredients. It’s a jarring note in what could be an otherwise nice recipe post. Especially when, if you have a blender, you can make your own much better cashew milk. There is so much advertising for Silk because it was a sponsored post for Silk. That’s how this works. This post is over two years old. You are more than welcome to use homemade cashew milk, which would always be my first choice and if you follow me regularly you know that is always how I work. I enjoy partnering with companies like this that are better options for those that don’t want to make their own. What a fabulous recipe! I didn’t have the fresh nutmeg on hand, but it turned out beautifully all the same! Since going vegan 4 years ago, eggnog was something I missed having at Christmas time. 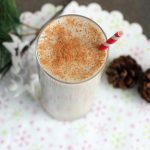 I’ve tried the vegan eggnog drinks sold in health food stores at this time of year, but none compare to the delicious smooth taste of this recipe. Thank you, it’s brilliant! This looks amazing. I’m going to try it tonight. Can you tell me – what is the purpose of the dates? The dates sweetened and thicken. Will it keep in the fridge for a day? Just made it. Haven’t had eggnog since I was in my teens, but I remember the smell and taste. Came out really good. Not as thick as I remember, but that’s a good thing! Hi! 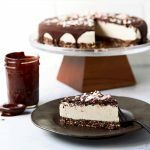 This recipe can be refrigerate? Yes this should be refrigerated, for sure. Hi , how long can it last if refrigerated ? Oh man! This was delicious! I only had almond milk so that’s what I used, but I’ve seen cashew milk in stores now. Can’t wait to try this again with the cashew milk (and a little booze). Thank you for such a yummy alternative to the usual nog. this was rich and creamy with a great spiced flavor. we added some bourbon and drank it with an ice cube. best vegan eggnog i’ve had. Dis I miss where the nutrition info was posted? I just made this tonight, used 13 oz. of coconut milk, spiked the whole lot with about 200 ml. of rum and curled up in front of the fire with a great book to wait for Santa! Great recipe!